Emma Aura De McKenzie, MS., MAOM., L.Ac. Emma McKenzie was born in Mexico City. She has lived in several cities of the US, Mexico, South Africa and New Zeland, which together with her educational training, she thinks has broaden her perspective of life. As a counselor practicing in Mexico she became interested in Acupuncture because even though she was successful treating depression, anxiety, identity problems, marital problems and other mental conditions with cognitive psychology and other psychological techniques, she wanted to be able to offer a better service to patients who were in need of medication besides counselling. She realized that most of the people who came to her office for help, were interested in natural ways of healing, and did not want to be referred to a psychiatrist or medical practitioner. She tried acupuncture herself for a pain in her right upper back which had been bothering her for more than one year. Dr. Oscar Heras who was a professor of Ryodoraku acupuncture style, gave her one treatment with this method and she was free of the pain right after the treatment. The pain never came back. She was convinced that acupuncture worked. 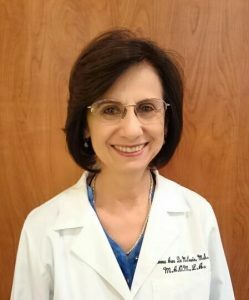 Dr. Heras was also an expert on Mexican herbal medicine and she started taking instruction from him, learning acupuncture techniques and herbal pharmacology. After extensive training in Japanese Ryodoraku acupuncture, Traditional Chinese Acupuncture, Iridology, naturopathy, Flowers of Bach, and Mexican herbal pharmacology in Cuernavaca, Morelos and in Mexico City, in 2007 she traveled to China for more training. She received instructions in two traditional acupuncture hospitals including the University Hospital of Traditional Oriental Medicine in Tianjin, receiving instruction from Dr. Shi Xue Ming, author of extensive research and publications, former president of the Tianjin University Hospital. While she was there, she was learning the methods o Traditional Chinese Medicine and acupuncture as they are applied in China. At the same time, she joined a modern version of Japanese Ryodoraku acupuncture with Miridia Technology in the US with the purchase of AcuGraph, an advanced imaging scientific program developed by Dr. Adrian Larsen, which she incorporated into her practice. She still uses this program and her patients love the idea of being able to see on a computer screen, their imbalances in their acupuncture channels and their progress through therapy. Go to Testimonials to read about this. When Emma McKenzie added acupuncture and herbal therapy to her counselling, she realised that her patients got better sooner than expected when using this integrative approach. She also noticed that some patients preferred to see an acupuncturist over a psychologist for their mental health issues. Also, many of them suffered from physical illnesses at the same time, and acupuncture and herbal therapy were successfully taking care of that, relieving some of their anxiety or depressed symptoms. If you are currently taking psychotherapy, counselling, or medication for an emotional condition, acupuncture can speed up recovery or increase its effect to help your condition. When she moved to Houston, Emma McKenzie was divided by two equally strong forces to decide which way to head, since she did not have a Texas license for either Counselling or Acupuncture. She decided to obtain her license as an Acupuncturist, which meant obtaining a second four years Masters degree at ACAOM (American College of Acupuncture and Oriental Medicine). ACAOM is considered one of the top acupuncture Colleges in the nation, and is affiliated with the Methodist Health Care System. Their curriculum requires over 3,000 didactic hours in acupuncture foundations, acupuncture techniques and other oriental medicine techniques, Tai Qi and Qi Gong, Western physiology and anatomy, internal Western and Oriental medicine, and Chinese pharmacology, among other couses. During this post-graduate program, she interned at the Methodist Hospital and received training directly from Dr. John Paul Liang, president of ACAOM, and at the College’s Clinic where she also volunteered for one extra year after graduating. Licensing is achieved through extensive testing by the National Certification Commission, and the Texas Medical Board. I am happy to have chosen this path, as I have been fortunate to help many patients with either psychological or physical pain, with acupuncture and herbal pharmacology. I look forward to continue to help many more patients. When you come to see me, you will find a compassionate, down to earth and empathic person who will work with you at an individual level, tailoring the therapy according to your unique needs to improve your health and well-being. My goal is to help you achieve the best health possible free of pain and suffering at an affordable price. Emma McKenzie’s approach to healing is finding the imbalances which may have caused your health problems to help you achieve balance between your body, mind, emotions and spirit. Gracias por visitar mi página. ¡Le deseo muy buen día!